One of the first questions one asks when evaluating a wireless system is “what range will it get?” The answer to the wireless range question is somewhat complicated. The range of a wireless system is dependent on several interdependent factors. Some are internal to the design of the product and some are external. There are ways of estimating the wireless range of a system by taking into account several factors.The first factors in determining wireless range are internal to the design of the system. Transmitter output power is the amount of power produced by the transmitter’s output stage. Essentially, this is how loud the transmitter is. Receiver sensitivity is how low a signal level the receiver can pick up and output the data with an acceptable number of errors. Essentially, this is how well the receiver can hear. The transmitter and receiver antenna gains are how much the antennas focus the transmitted and received energy in the direction of each other. There is quite a bit of information behind this, but a full explanation is beyond the scope of this article. Please see Application Notes AN-00500 and AN-00501 for more details. Mismatch losses are power losses that occur inside the product between stages. Nothing is ever perfectly matched, so some amount of the energy is lost in the system as heat. Finally are internal noise sources, primarily on the receiver side. Switching power supplies, oscillators and high frequency logic create ElectroMagnetic Interference (EMI) that can affect the receiver’s sensitivity. Essentially, it creates noise that hurts the receiver’s ability to hear the transmitter. Looking at external factors, the primary factor that affects wireless range is the radio signal that spreads out as it travels from the transmitter to the receiver. This means that the farther the signal travels, the weaker it gets. This effect is frequency dependent, so higher frequency signals get weaker faster. This is due to the physics of electromagnetic propagation and there is nothing that can be done about it. Interference is always a concern when it comes to wireless range. Other transmitters on the same frequency in the same area at the same time will interfere with a transmission in most cases. The propagation path is the path that the signal takes from the transmitter to the receiver. If there is nothing in the path, then the signal will not be attenuated. 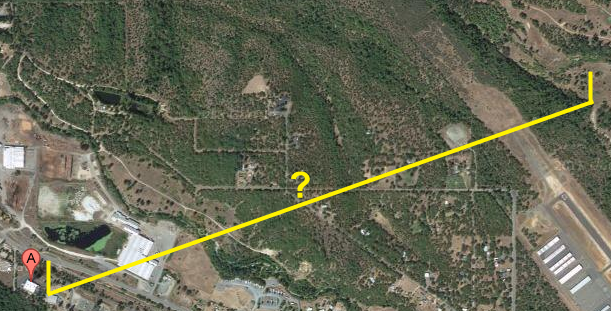 If there is a massive building in the way, then the signal will be attenuated and get weaker much faster. Finally is something called multipath. This refers to the fact that as a transmitted wave spreads out, it can reflect off of things in the environment. This can be the ground, trees, buildings, mountains, walls or anything else. The reflected signal can make its way to the receiver, but will get there later than a part of the signal that traveled a direct path. Multiple reflections can get to the receiver from multiple directions. These reflected signals can interfere with the direct signal and even cancel it out to the point that the receiver does not pick up any good data. With all of this, you can see how it could be difficult to figure out a system’s wireless range. However, there are some approximations, assumptions and simplifications that can be made to arrive at a range estimate. The most basic approach is to not worry about the external factors that can’t be controlled. This assumes that the antennas are in an area where there are no external affects, typically called free space. 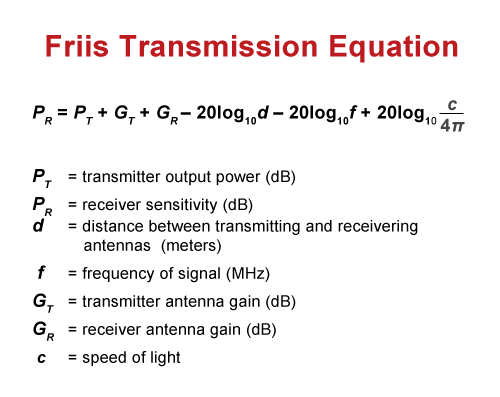 To start, we account for how the signal spreads during propagation, the gains of the antennas and the frequency of operation and we arrive at the Friis transmission equation. Solving this equation for distance (d) gives the most basic way to estimate the wireless range of the system knowing the rest of the system parameters. This equation can be modified with mismatch loss and an absorption factor if the signal is travelling through something other than free space. Loss factors can also be added if the two antennas are not correctly aligned. Measuring all of these factors can be tedious and time consuming and it is still only valid for a free space environment. Frequently, these factors are not calculated and a constant 20dB loss is included. This provides a reasonable approximation of real world line-of-sight performance. Line-of-sight refers to an environment where there is nothing between the transmitting and receiving antennas, but some loss for multipath and environmental attenuation. The units used for c need to match the units for d. The conversion for f from Hz to kHz or MHz can also be added into this term (divide c by 1,000,000 to use MHz, for example). This equation provides a reasonable estimate of range for a wireless RF system but it is just an estimate. The real RF world is dynamic and many things affect the signal. It is not always practical to model and calculate the effects of the environment, especially for mobile devices that continuously move around. Wireless range estimation is generally good enough in these cases to get a feel for how the product will work. It also allows different wireless solutions to be compared based on their specification sheets before a design has begun. Still, there is nothing like getting out in the field and seeing what really happens.